Joanne is a wildlife artist who grew up in Montreal, Quebec. In her early twenties she moved around the country quite a bit and has now settled down in Maitland, Nova Scotia with her partner Glenn and their two daughters Emily and Mary. Joanne has always dabbled in some form of art; as a child in Montreal it was pencil and ink drawings. Later as an adult she worked with oils. 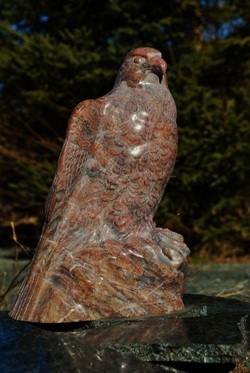 In the late 1980's she discovered the world of bird carving while living in East Jeddore, Nova Scotia. She was hooked from that moment on and gave away her oils and began her work as a carver. In the beginning she focused on the highly realistic work of bird carving and competed wherever she could. Joanne won many awards and has birds in the United States, Europe and all over Canada. She has done work for Ducks Unlimited and has work in the Legislative Assembly of the North West Territories. A few years ago Joanne began to experiment with a looser, more impressionistic style of animal and bird carving. She also began to work with the local stone found in Nova Scotia, including sandstone, gypsum and Cape Breton marble. Although these pieces do not have the high detail of her earlier bird carvings, they certainly contain the spirit of the animal or bird portrayed in the carving. All of Joanne's carvings are original works of art. None have been reproduced. You are guarenteed an original, one of a kind carving. 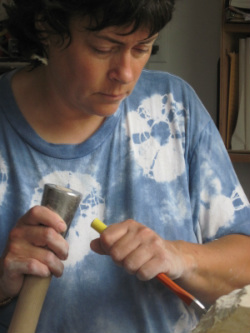 Joanne accepts commissions of stone and wood carvings. If you are looking for a specific highly detailed bird or animal carving, please feel free to contact her and discuss your ideas with her. The marble and gypsum work have been sanded with 2400 grit sandpaper to produce a highly polished finish, no oils or such have been applied to achieve this glossy finish. The detailed birds are painted with artist's grade acrylic paint. All parts of the carving are made from Tupelo wood, this includes the flowers, leaves and rocks. The wood carvings are carved from a variety of woods including walnut and maple and finished with either polyurethane or oil, depending on the wood. Looking back at all the art work I've created over the years; animals and especially birds have always been the main subject. I have only ever carved one human figure and that was a pair of hands, and what were they holding but a little chickadee. I often wonder why I don't sculpt the human figure. After all, it is something that is always around me and if I ever needed a model, I would be able to find one easy enough. And maybe that is why I carve animals. They are more mysterious, more fleeting, less accessible. I don't create what I create to make a statement about the world. I do not try to portray the plight of that specific animal. What I do try to create is the essense of that animal. I may see something in nature, a bird flying, or maybe just standing there watching me as I am watching it. Or perhaps it is unaware of me as it is focused on scratching that hard to reach place. The way it's body is curved around itself, muscles stretching; that fleeting moment. Or maybe I see a photograph that catches the spirit of that animal. That photograph makes me want to try to capture that spirit, that essense. To try to reproduce that intangible spirit in to something hard and unyielding like a piece of stone. I am not an artist who wants to portray the negative in humankind, there is enough of that already out there. I am an artist who is trying to portray the simple yet complex natural beauty of the animals and birds that I see around me.